trackside (Missouri) on 2013-11-14 14:17:20. Pros - The video contains good Alaskan scenes of trains trekking through deep winter snows. A great additive is the radio chatter between train crews and dispatchers and is the highlight of the DVD. All videos should incorporate such tranmissions. The hot wheel set-out and engine brown-out communications are unique and rare. Cons - Even though Pentrex puts their name on this DVD the videography was done by someone else and is somewhat home made. steve (MD) on 2013-10-30 15:09:21. Railroad videos are almost always made under "ideal" conditions; everybody loves a sunny day...this video is such a welcome change! Trains take on their deepest character in rain, dark, and snow. Wish we could get more of these! I thought the narration was weak, geared more toward younger viewer and very limited on the trains info. Good views of trains working in winter climate, didn't give much about challenges of winter railroading, which is what I was looking for. Would suggest purchase only if on sale. Railroading is always a challenge, be it in the warmth of sunny Florida, or the mountains of British Columbia, or the scenic wonderland of Alaska. Add in the elements of Mother Nature, and the challenge increases. Alaska, in June it's the land of the midnight sun, but in the winter 5 hours of daylight is a good day. Bring in to play temperatures below -50F, and snow, what we have is a major challenge. It takes tough men to do the work, but it does get done. This is one of the most interesting videos You will ever see. 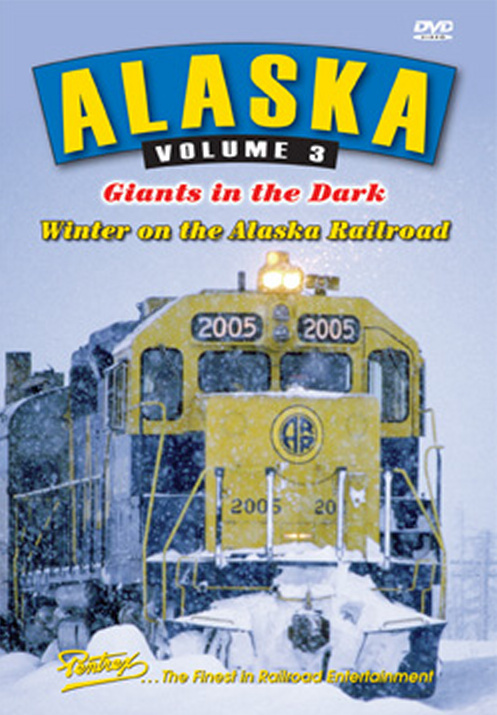 Being that a lot is in the dark, and snow covered, the scenery is not as apparent as the previous volumes, But a purchase of this video will be a highlight of any railfan's collection. This is now in my top 5!!! Highly Highly recommended! Pentrex videos are all excellent. This is different. I want to hear more of the "scanner" talk like this has.